Google's free calendar application,Google Calendar, has several handy features that make it relatively simple to manage your schedule. If you don't already have a Google account, you'll need to sign up for one before you can use Google Calendar. Quickly add any event to Google Calendar, using plain language. Use Quick Add to Translate Your To-Do List. Rather than go through the time-consuming process of adding every event detail (title, date, time, etc. ), do yourself a favor and get comfortable using GCal's Quick Add feature. Type any plain-language appointment-related text—such as "Pick up dry cleaning from A1 at 1pm next Tuesday"—into this box, and GCal will translate that notation into an event with the proper date and time. Next, to ensure that you don't forget, you could manually edit the event and set a custom notification to remind you when the event is approaching. If you're prone to forgetfulness, you can also set up a default reminder for every event on your calendar. Set up default notifications so you always receive a reminder before an event. Go to GCal; click Settings, Calendar Settings, Calendars; find the calendar you want to adjust default notifications for; and click Notifications. You can set up one or more default reminders for any new event that you subsequently add to your calendar. Bear in mind that you can override the defaults if you prefer a different sort of notification or if you decide that you don't want any reminder at all. Google Calendar integrates with Gmail to help you quickly create new events based on an e-mail message. Use Calendar in Your Other Google Apps. If you're an avid user of Gmail, Google's e-mail program, GCal can save you even more time. Gmail automatically recognizes when the text of an e-mail suggests an event or appointment, and provides you with a Quick Add link that you can click to automatically populate a new GCal event with many of the event's details—the what, where, and when—already filled out. 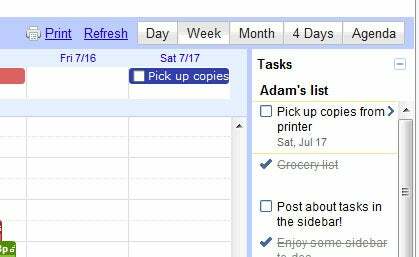 Google Tasks integrates your to-do list directly with Google Calendar. Remember Recurring Events. To set up a recurring event in GCal, either add a note about the recurring activity to your quick-add text (e.g., "Move car every Tuesday at 8am") or click the Create Event button in Google Calendar and set your recurring schedule in the Repeats section.